This is a retreat for all alumni of the Internationalizing Teaching and Learning Faculty Cohort Program. The goal of the retreat is to come together, share your successes and challenges in internationalizing teaching and learning, and explore teaching activities to implement in your courses. Join us for a warm breakfast, exchange of ideas, opportunities to collaborate with other ITL faculty and team members, and continuous discovery of creative ways to internationalize your courses. Presenter: Professor Zdenek Janik from Czech Republic. Zdenek has been an assistant professor in the Department of English language and literature of the Faculty of Education, Masaryk University since 2002. His teaching and research focus on cultural studies and intercultural communication. Dr. Janik's current research work involves the analysis of international students' negotiation of identities in intercultural communication. Please join us to celebrate the recipients of the 2018 Mestenhauser Student Award for Excellence in Campus Internationalization. The award is named in honor of Dr. Josef Mestenhauser (1925-2015). RSVP here. How are international student needs different from and similar to the needs of other multi-lingual and monolingual students in an interactive, collaborative classroom? Presented as part of a joint project of the Department of Family Social Science, the School of Social Work, and the Dean's Office in the College of Education and Human Development; collaborators include Molly Rojas Collins, Rhiannon Williams, Jill (JT) Trites (2014-15 ITL Cohort), and Margaret Delehanty Kelly. RSVP here. The purpose of this presentation is to increase faculty's understanding of the digital experiences of their diverse students and how this might impact their teaching. The presenter will offer several strategies that can be helpful in supporting the online engagement of these students. Presenter: Shanton Chang is Associate Professor and lectures in Change Management and the Social Impacts of Information Systems at the Department of Computing and Information Systems, University of Melbourne. His current primary areas of research include the Social Aspects of Online Technology, Online Behaviour, the Use of Social Media in Businesses, Education and Health, Information Needs and the Relationship between Cultures and Information Technology. He is particularly interested in how broadband technologies and Web 2.0 has impacted on education and health. Shanton consults on online behaviour of young people, online education and interaction across cultures. He was Assistant Dean (Exchange) at the Melbourne School of Engineering, overseeing the Exchange and Study Abroad Program for Engineering and IT students. What are the digital experiences of international students and what does this mean for services that are needed to support the diversity of digital skills among the student body? A summary of available digital technologies that might assist service providers and a discussion of guiding principles for using these technologies. The aim of this workshop is to increase participants' understanding of the digital experiences of their diverse student body and how this might impact their service offerings. The workshop will focus on the development of potential services that might be needed to support the online engagement of these students. Register here. Facilitator: Shanton Chang is Associate Professor and lectures in Change Management and the Social Impacts of Information Systems at the Department of Computing and Information Systems, University of Melbourne. His current primary areas of research include the Social Aspects of Online Technology, Online Behaviour, the Use of Social Media in Businesses, Education and Health, Information Needs and the Relationship between Cultures and Information Technology. He is particularly interested in how broadband technologies and Web 2.0 has impacted on education and health. Shanton consults on online behaviour of young people, online education and interaction across cultures. He was Assistant Dean (Exchange) at the Melbourne School of Engineering, overseeing the Exchange and Study Abroad Program for Engineering and IT students. A recording of the presentation and accompanying materials will be available after the event on the CARLA recordings and handouts (archived presentations) page. Second language classes are often assumed to be inherently ‘international,’ and have the potential to contribute significantly to institutional goals of producing 'globally competent’ citizens. Upon closer examination, however, what international exactly means is not always clear, and course materials and learning outcomes often rest upon hegemonic discourse and communicative standards that place the U.S. student experience at the center. In this presentation, the speakers will explore how the Internationalizing Teaching and Learning (ITL) framework (Clifford 2009; Hovland 2009; Leask 2009; University of Minnesota 2013) provides a conceptual structure and pedagogical method for addressing these issues. From a cross-disciplinary perspective, we will explore the question of how an internationalized curriculum is defined, what this framework can offer language teachers at the individual level, and what benefit it can have at the course and programmatic level. The presentation will include key considerations for effectively integrating the ITL framework in multi-section, multi-instructor contexts as well as share preliminary findings from data gathered in a course organized using the ITL model. Sara Mack is a Senior Lecturer and Coordinator of Spanish 1004 at the University of Minnesota, and currently serves as a Spanish Faculty Coordinator Assistant for the College in the Schools program. Her areas of interest include critical approaches to multi-section course curriculum and materials, inclusive design, sociophonetics, and learning and memory. Mandy Menke is an Assistant Professor of Hispanic Linguistics and Director of Language Programs in the Department of Spanish and Portuguese Studies. She researches topics related to second language acquisition and foreign language pedagogy, at both the university and K-12 levels. Sara Mack and Mandy Menke participated in the 2016-17 Internationalizing Teaching and Learning Faculty Cohort Program. This presentation is cosponsored by the Department of Spanish & Portuguese Studies and the Internationalizing Teaching and Learning Faculty Cohort Program. Please join us for a Spring Retreat for all alumni of the Internationalizing Teaching and Learning Faculty Cohort Program. At the retreat, we look forward to providing opportunities for collaboration and exchanging ideas on topics such as effective teaching activities, intercultural assessment, and publishing on internationalized teaching. RSVP here. The purpose of this presentation is to share recent findings from educational and cultural neuroscience and to propose concrete strategies to faculty on how they can use these findings to deepen intercultural learning for their students. Presenter: Yuliya Kartoshkina is an Education Program Specialist for the Internationalizing the Curriculum and Campus initiatives at the University of Minnesota. She specializes in exploring best practices in intercultural teaching and learning. Yuliya earned her doctoral degree in Educational Foundations and Research from the University of North Dakota (UND). Her dissertation research focused on examining best practices of faculty teaching abroad and metacognition behind those practices. Yuliya believes in the power of interdisciplinary research. One of her main research interests lies in exploring how findings in educational and cultural neuroscience could inform and enrich practices in intercultural teaching and learning. In the past ten years, Yuliya taught a variety of university courses and workshops on intercultural communication, intercultural learning, brain-based pedagogy, and public speaking. For several years she has been involved in NAFSA: Association of International Educators, where she presented her research, chaired sessions, and served in several leadership roles for the Teaching, Learning, and Scholarship knowledge community. Through her practice, teaching, and research, Yuliya seeks to inspire others to learn about the human mind, how it learns, as well as how it shapes and is being shaped by cultural environments. Have you heard about COIL or globally networked learning? Are you interested in the use of technology in a course to connect students across international borders? (Already doing it?) This year's COIL Coffee Hours will provide an opportunity for faculty and staff to gather and learn about the University of Minnesota COIL initiative and to share resources for COILing courses. Sessions available in person and online. More information and registration here. This 75-minute workshop will introduce the principles of internationalizing teaching and learning to faculty who are interested in designing or redesigning courses for significant global, international, and intercultural learning. Participants will leave the workshop with a set of internationalized course goals and will begin to explore the strategies and assessments in an aligned course design. To register, please visit http://gpsa.umn.edu/web-fm/ciregistration/. Attendance is free of charge for University of Minnesota faculty and staff; the workshop cost is $50.00 for non-University of Minnesota participants. Non-University of Minnesota participants will be contacted with further information about payment after registering for the workshop. Join the Center for Educational Innovation and the Internationalizing Teaching and Learning team to discuss “The International Student Density Effect: A profile of a global movement of talent at a group of major U.S. universities”. This study examined data collected in a recent Student Experience in the Research University (SERU) Consortium survey. Specifically the authors looked at socio-economic background, motivations, behaviors, and levels of satisfaction for both US and International Students (IS) at 15 different universities including the University of Minnesota. They categorized the 15 schools as Low, Medium, or High Density for the number of IS, and use this data to look for correlations with several different educational outcomes. High Density IS universities (of which the Uof M is one) correlate with both positive and negative outcomes, suggesting opportunities and challenges for classroom learning. We will discuss these findings and their implications for teaching. You do not have to read the article to benefit from attending the journal club. Bring your lunch, dessert will be served. Parking in the Gopher Lot will be validated. For a copy of the article or to attend remotely: email Christina Petersen pete6647@umn.edu. Dr. Coultrap-McQuin will join us as a special guest for our first COIL Coffee Hour to share her experiences of COILing multiple courses at SUNY-Oswego, where the COIL model originated. This 90-minute workshop is designed to introduce participants to several principles of brain-based learning. Knowing these principles will help faculty explain why some teaching practices work better than others to achieve intercultural learning outcomes. The presenter, Yuliya Kartoshkina (University of North Dakota), will introduce a principle, provide examples of how this principle might be used in intercultural learning, and then will ask faculty to share similar examples from their teaching practices. This will be an advanced discussion for faculty and staff familiar with intercultural learning. The discussion will include ways to share findings from the workshop with a wider academic audience. Space for this event is very limited; please contact Mary Katherine O'Brien at obrie713@umn.edu if you are interested. Professor Emeritus Josef Mestenhauser passed away on March 14, 2015. Josef Mestenhauser's more than fifty-year career made an indelible impact on the University of Minnesota and the field of international education. Please join us as we remember our dear colleague and friend, Dr. Josef Mestenhauser. More information and RSVP at http://global.umn.edu/icc/legacy/index.html. International education is about crossing borders to find oneself and others. We do this by crossing physical borders, but often the most important borders are those in our heads. In her lecture, Teekens will explore the relationship between international education and freedom and the connection with themes of identity and cultural awareness. More information and registration at http://global.umn.edu/icc/legacy/index.html. Welcome back to campus! This is an open call for all members of the Internationalizing Teaching & Learning faculty cohorts to gather together in an informal setting. Continental breakfast will be provided. RSVPs appreciated: please email obrie713@umn.edu. Offered during the Center for Educational Innovation’s Teaching Enrichment Series, this session will provide an overview of current efforts to internationalize the curriculum at the University of Minnesota, with a focus on resources to support faculty in their interests and efforts. Approaches to be discussed include course design for global learning, globally networked learning/COIL, and increasing classroom interaction between international and domestic students. Group work is an essential part of American classroom learning. This workshop focuses on the process and expectations of working on group projects for new international students beginning their academic programs at UMTC. Offered in partnership with the Center for Educational Innovation, this interactive session is part of International Student & Scholar Services’ Global Gopher Weeks. Mary Katherine O'Brien (Education Specialist, GPS Alliance Dean's Office) and Kate Martin (Assistant Director, Center for Educational Innovation) will attend and present at UM-Crookston's Spring Professional Development Day on February 16. The theme of the professional development day is "High Impact Practices in Undergraduate Education." O'Brien and Martin will partner with Brian Dingmann (Associate Professor-Biology, UM-Crookston) and Katy Nannenga (Assistant Professor-Biology, UM-Crookston), both alumni of the Internationalizing Teaching & Learning faculty cohort program, to present a session on backward course design (9:45-10:30 a.m.). In collaboration with other ITL faculty cohort alumni and Kimberly Gillette (Director of International Programs, UM-Crookston), O'Brien and Martin will also facilitate two roundtable discussions on global learning (11 a.m.-12:p.m. and 12:45-1:45 p.m.). All faculty and staff from the Crookston campus community are welcome to attend this event. More information: Mary Katherine O'Brien (obrie713@umn.edu). Nine members of the 2014-15 Internationalizing Teaching & Learning faculty cohort program will gather on the Twin Cities campus for an intensive three-day session on internationalizing their courses and their teaching. The ITL program engages University of Minnesota faculty in professional development aimed at internationalizing the curriculum, which supports the University’s educational mission to “graduate lifelong learners, leaders, and global citizens.” These new cohort participants join the 44 faculty members who have participated in the program since 2010 in a system-wide community of practice. The program is sponsored in partnership with the Global Programs and Strategy Alliance, the Center for Educational Innovation and International Student & Scholar Services. For more information, please visit the ITL Faculty Cohort webpage. Applications for 2014-15 ITL cohort are no longer being accepted. For more information, contact Mary Katherine O'Brien (obrie713@umn.edu, 612-625-9520). This pre-conference workshop will focus on achieving global outcomes through the transformation of curricula, educational strategies, and educators themselves. Members of the ITL team and ITL alumni will describe a model of course design for significant global learning based upon the Association of American College & University's (AAC&U) rubrics and Fink's (2003) six dimensions of course design at AAC&U's annual "Global Learning in Colllege" meeting. The workshop is designed for faculty members who are new to internationalizing higher education curriculum or have begun the process and seek more models to guide their efforts. Registration is required for this event; click here for more information about AAC&U's Global Learning College meeting or contact Mary Katherine O'Brien, Assistant Education Specialist, Global Programs & Strategy Alliance (obrie713@umn.edu, 612-625-9520). Members of the Internationalizing Teaching and Learning (ITL) team will visit the University of Minnesota, Duluth campus Ocotober 1-2 to meet with faculty and other members of the UMD community for classroom observations, meetings, and to learn more about UMD's ongoing internationalization of their curriculum and campus. Members of the Internationalizing Teaching and Learning (ITL) team will visit the University of Minnesota, Crookston campus September 23-26 to meet with faculty and members of the UMC community about their efforts to internationalize the curriculum. Congratulations to the newly selected faculty members in the 2014-15 Internationalizing Teaching and Learning (ITL) cohort program: Joseph Alia (Morris), Karin Hamilton (Twin Cities), Shahram (Shane) Missaghi (Extension), Chang’aa Mweti (Duluth), Andres Perez (Twin Cities), Jennifer Powers (Twin Cities), Jill Trites (Twin Cities), and Deena Wassenberg (Twin Cities). The Internationalizing Curriculum and Campus conference showcases the diverse efforts of faculty, staff, and students to internationalize the University of Minnesota. This biennial conference is free and open to all University of Minnesota staff, faculty, and students interested in internationalizing the curriculum and campuses. For more information and to see photos from the conference and videos of past conference sessions, please click HERE. Engaging International Students in Collaborative Learning Experiences. 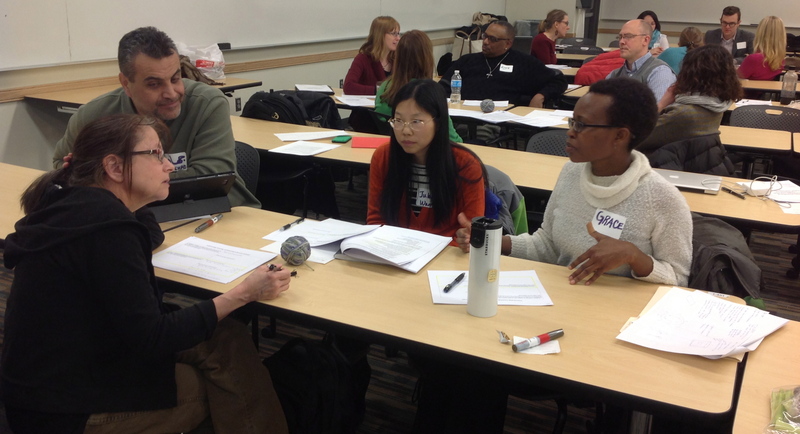 Dr. Barbara Kappler (International Student & Scholar Services, UMTC) and Kate Martin (Center for Teaching & Learning, UMTC) explored the nuanced skills of facilitation for global learning in this system-wide, ITV-delivered workshop. Participants discussed and practiced elements of effective discussions: creating an atmosphere in which all students engage; scaffolding activities prior to discussions; designing the actual discussion activities; and, assessing what students learned through post-discussion reflections. The GPS Alliance awarded the inaugural Mestenhauser Student Award for Excellence in Campus Internationalization to three University of Minnesota students: Douglas Kennedy, Sook Jin Ong, and Khoa Vu. The recipients were recognized at an award ceremony at the Weisman Art Museum. Please visit the Mestenhauser Legacy Initiative webpage to see photos from the event and to watch digital stories produced by the students. Professor Teekens served on the board of NUFFIC, the Netherlands' organization of international education, was on the faculty at the University of Amsterdam and Twente University, and served as the director of the Socrates National Agency and Erasmus Mundus. Teekens has published in the field of international education and currently serves as senior fellow for NAFSA: Association of International Educators and AFS Netherlands. In an event co-sponsored by the GPS Alliance's Internationalizing the Curriculum and Campus initiative and the College of Education and Human Development International Programs and Department of Organizational Leadership, Policy, and Development, Teekens discussed global mobility in the context of higher education. Dr. Akosua Addo (Music, University of Minnesota Twin Cities) and Dr. Shelley Smith (Instructional Development Service, University of Minnesota Duluth) facilitated a system-wide, ITV-delivered workshop to guide faculty through the process of publishing scholarly work on their efforts to internationalize the curriculum and their teaching and learning. Collaborative Online International Learning (COIL) is an educational strategy to connect students across the globe and address the grand challenges facing today's world. 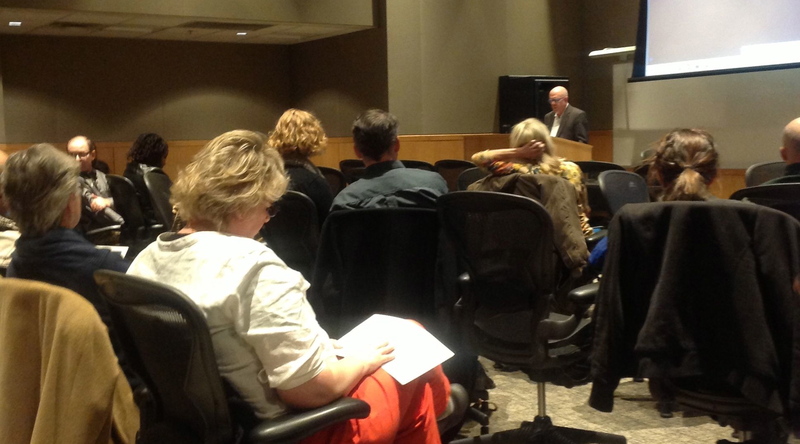 Professor Jon Rubin, the director of the SUNY COIL Center and colleague Sarah Guth presented to an audience from the University of Minnesota and the Minnesota State Colleges and Universities on the development of globally networked classrooms across the curriculum. Internationally recognized course design and college teaching expert Dr. L. Dee Fink visited UMTC to present a workshop entitled "Course Design for Significant Global Learning" for faculty and instructors at the University of Minnesota. Fink also met with members of the Internationalizing Teaching & Learning faculty cohort programs to discuss program-level design and planning for the internationalization of degree programs. 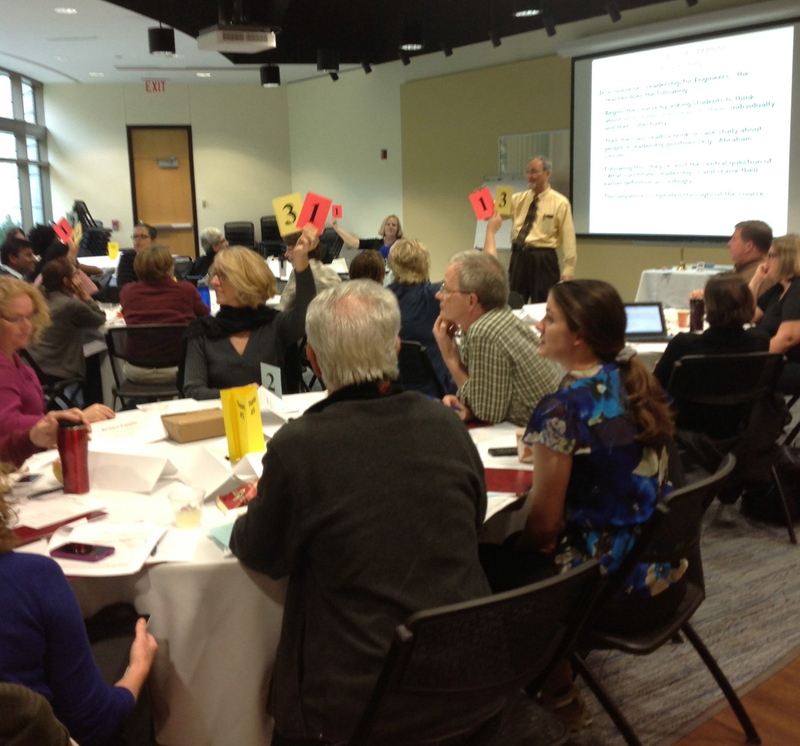 Dr. James Ford (History) and Ryan Furness (Spanish) co-presented on internationalizing the curriculum with members of the ITL team at UMR's Center for Learning Innovation All-Faculty meeting. The Internationalizing Teaching and Learning (ITL) team visited the UM-Crookston campus September 17-20, 2013, to meet with faculty and members of the UMC community about their efforts to internationalize the curriculum and to conduct course consultations with ITL faculty cohort alumni. The ITL team presented a Thursday Commons session on engaging international students in classroom group work and ran an intercultural simulation for students. What Does it Mean to Internationalize the Curriculum? UMM faculty and Internationalizing Teaching & Learning faculty cohort alumni Sarah Buchanan (French, ITL '13), Rebecca Dean (Anthropology, ITL '13), and Brook Miller (English, ITL '13) presented strategies they have used to internationalize their courses during UMM's Fall Development Day presentations. ITL team members Mary Katherine O'Brien (GPS Alliance) and Cristina Lopez (Academic Technology Support Services) facilitated an interactive workshop on internationalizing the curriculum.